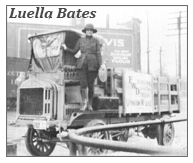 In previous issues, we highlighted Luella Bates, the first woman truck driver in 1918 and Rusty Dow being the first woman to drive a fully loaded truck the entire length of the Alaska Highway in 1944. This issue, we intoduce, Lillie Drennan from Texas started a trucking company with her husband to take advatage of an oil boom in 1928. Lillie became the sole owner of the Drennan Truck Line. Lillie received her commercial truck-driver's license in 1929 after the Railroad Commission began supervising the motor-freight business in the state. Luella Bates worked for the Four Wheel Drive Auto Co. from 1918-1922. During World War I, she was a test driver traveling throughout the state of Wisconsin in a Model B truck. After the war, when the majority of the women working at Four Wheel Drive were let go, she remained as a demonstrator and driver. During the infancy of the trucking industry, she played an important role in the history of women in trucking. 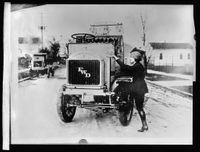 Last issue we talked about Luella Bates being the first woman truck driver in 1918. This issue, we'd like to highlight Rusty Dow, who was a truck driver for the U.S. Army Engineers/Alaska Defense Command during World War 2. In 1944, Rusty became the first woman to drive a fully loaded truck the entire length of the Alaska Highway, completing the 1,560-mile trip from Fairbanks to Dawson Creek in just seven days.